This Dec 22 & 23 ‘Floorwork Explorations’ by Samadhi’s founder Vraja Sundari Keilman at the Samadhi Yoga Studio in Florence, Italy; a two-days workshop all about flow and moving connections, exploring physical possibilities with Samadhi’s authentic dance style in floorwork accompanied with live music by Gabriele Pollina | Open to all levels – sign up now at www.yogafirenze.it and join us at our event Floor Work Exploration! Nel seminario di esplorazione di Samadhi Floorwork, tenuto dalla fondatrice e direttrice della Samadhi Dance Company, Vraja Sundari Keilman, i partecipanti avranno l’opportunità di imparare di più sull’uso della pavimentazione nella danza combinata con lo stile di danza unico di Samadhi. 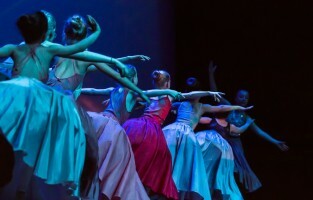 Questo stile di danza è caratterizzato dalla sua fusione innovativa di danza contemporanea combinata con yoga, balletto classico, danza urbana, jazz moderno e danza classica indiana. Lavorare con le tecniche utilizzate per creare questa fusione incoraggia il partecipante ad andare oltre i confini dello stile, dei limiti fisici e dell’età per trovare l’unità nella diversità. Nel laboratorio ci sforziamo di giocare con la forza di gravità e di approfondire la nostra fiducia nel rapporto con il pavimento e il nostro corpo. Come connettersi e lavorare davvero con la forza di gravità. Usare la gravità a nostro vantaggio per creare movimenti organici e apparentemente senza sforzo, aumentare lo slancio nei movimenti e allungare completamente il corpo nello spazio in modo attivo e giocoso. Attraverso sequenze di movimento che mirano a collegare i nostri corpi con lo spazio dentro e intorno a noi stessi in relazione al pavimento, i partecipanti avranno la possibilità di esplorare e migliorare le loro possibilità di movimento e di aumentare la fiducia nelle loro capacità fisiche. Lo stile si concentra sul collegamento di ciascun movimento con il prossimo in modo quasi meditativo, aumentando la consapevolezza e migliorando la qualità di ogni movimento, nonché la propria esperienza personale di espressione fisica ed energetica. Nella danza ci sforziamo di connetterci a tutti i livelli; con gli elementi, il nostro corpo, gli altri corpi, l’energia circostante, la musica e il momento. Ballare è connettere e siccome la danza è un linguaggio universale, ha la capacità di parlare e comunicare con tutti e chiunque. Collega il nostro mondo interiore con il mondo esterno, ed è in connessione dove troviamo lo scopo e la felicità. Yoga significa “unione” o “legare”, quindi quando si avvicina la danza come nello yoga, stiamo letteralmente unendo o legando tutti questi diversi aspetti l’uno con l’altro. In the Samadhi Floorwork Exploration workshop taught by Samadhi Dance Company’s founder and director Vraja Sundari Keilman participants will have the opportunity to learn more about the use of floorwork in dance combined with Samadhi’s unique dance style. This dance style is characterised by its innovative fusion of contemporary dance combined with yoga, classical ballet, urban dance, modern jazz and Indian classical dance. Working with the techniques used to create this fusion encourages the participant to move beyond the boundaries of style, physical limitations and age to find unity within diversity. In the workshop we strive to play with gravity and deepen our trust in our relationship with the floor and our bodies. How to really connect and work with the pull of gravity. Using gravity and falling to our advantage to create organic and seemingly effortless movements, increasing momentum in movement and fully stretching the body in space in an active and playful manner. Through movement sequences that aim to connect our bodies with the space within and around ourselves in connection with the floor participants will have the chance to explore and enhance their movement possibilities as well as to increase their confidence in their physical abilities. The style focuses on connecting each movement with the next in an almost meditative way, increasing awareness and improving the quality of each movement as well as ones personal experience of physical and energetic expression. In dance we strive to connect on all levels; with the elements, our own body, other bodies, the surrounding energy, the music and the moment. To dance is to connect and as dance is a universal language it has the capacity to speak and communicate with everyone and anyone. It connects our inner world with the outer world, and it is in connection where we find purpose and happiness. Yoga means ‘union’ or ‘to bind’ so when dance is approached as in yoga, we are literally uniting or binding all these diverse aspects with each other. Sundari’s dance methods and vision aim to improve body-mind awareness by using the intelligence as a means to understand and collaborate with the body in a healthy and efficient way. The body is seen as an instrument or bridge to connect with others and express inner movement with the outer world. She strives to celebrate and rediscover the body’s unique intelligence, decreasing the chance of injury and forced, rigid movements while increasing physical freedom, range of movement and individual expression. The ultimate goal is to improve the quality of the individual’s personal experience during physical activities. Especially the use of positive thoughts and the emphasis on possibilities and solutions versus limitations and judgements play a vital role in this unique process developed by Sundari over the last 15 years. Vraja Sundari Keilman (1982, Amsterdam) grew up in a family of artists with a prominent spiritual and philosophical background based on ancient Indian knowledge. From a very young age Sundari and her sisters studied dance, music, art, drama and poetry and visited many performances, concerts and museums, giving them a strong artistic foundation and a broad view of art. At the age of 11 Sundari enrolled at the ballet academy in Amsterdam where she studied vigorously and developed a passion for combining dance styles and integrating other art disciplines in dance. Outside school hours she worked as a professional modern jazz and urban dancer for various events, dance battles, fashion shows and art projects. During this time Sundari started developing her own movement vocabulary and aesthetics embedded with philosophical concepts, wherein the choice of music would play a significant role, one of the characteristics of Sundari’s work. At the age of 16 she received her first internship in New York City with Alvin Ailey dancer and choreographer Julio Rivera where she began to specialise in modern dance. The following 4 years she was a dedicated student at the renowned Rotterdam Dance Academy/Codarts where she received her degree in modern ballet and contemporary dance. Her dance creations during these years were selected by the academy’s director Samuel Wuersten for various programs and festivals abroad which gave Sundari the opportunity to further develop her choreographic skills and particular vision of dance and fusion. As a professional dancer Sundari performed with the highly acclaimed Scapino Ballet in Rotterdam, worked for renowned choreographers such as Bruno Listopad, Ederson Xavier an Douglas Bateman and performed as a solo artist for numerous photographers, filmmakers, painters, musicians and writers of various styles. After going through a recovery period in 2006 due to injuries Sundari felt the urge to approach dance from a more healing perspective which led her to Alexander technique, mudra yoga, vijnana yoga and Indian classical dance. Especially the intelligent and healing aspects of these methods inspired her deeply and she dedicated herself to the research of combining these movement approaches with various dance techniques. This research led to the foundation of her dance company known as Samadhi Dance Company in 2007. From the start the company’s honest performances and different approach to dance captured the hearts of audiences, peers and press. Over the last 11 years Sundari has created and performed 15 full evening dance productions and her work has received diverse nominations and recognitions from international audiences. In 2012 her production ‘Saranagati’ was awarded with the national Dance Audience Award for ‘Best Dance Performance of 2011’ and her productions ‘Tusta’ and ‘Hanuman’ were nominated for ‘Favourite Dance Performance‘ of 2013 and 2015. In 2016 Sundari is nominated in the category ‘Best Dancer of 2015’ for her performance in Samadhi’s grand production ‘Hanuman’ and the company’s international fan base currently consists of 71.000+ followers. The company has performed in the Netherlands, Belgium, United Kingdom, Germany, Denmark, Sweden, Colombia, Italy, Bulgaria and Russia and aside of the Netherlands, Sundari is currently working closely with organisations based in Russia and Italy.